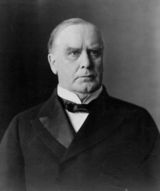 William McKinley ( January 29, 1843 – September 14, 1901) was the 25th President of the United States. By the 1880s, the Ohioan was a nationally known Republican leader; his signature issue was high tariffs on imports as a formula for prosperity, as typified by his McKinley Tariff of 1890. In 1896, he rallied the business and financial communities behind his successful effort to defend the Gold Standard against Free Silver. An indefatigable campaigner, he helped rebuild the Republican Party in 1896 by rejecting divisive ethnic issues and promoting pluralism—whereby every group in the nation would prosper and none would be singled out for attack. Working with campaign manager Mark Hanna, McKinley introduced new advertising-style campaign techniques that revolutionized campaign practices and beat back the crusading of his arch-rival, William Jennings Bryan. The 1896 election is considered a realigning election that ended the Third Party System and opened the Progressive Era or Fourth Party System. McKinley presided over a return to prosperity after the Panic of 1893 and was reelected in 1900 after another intense campaign. As president, he fought the Spanish-American War in response to reports of Spanish atrocities in Cuba. After victory in the "splendid little war", he annexed the Philippines, Puerto Rico, and Guam, as well as Hawaii. He was assassinated by an anarchist and succeeded by Theodore Roosevelt. Born in Niles, Ohio on Sunday January 29, 1843, William McKinley was the seventh of nine children. In 1869, he made Canton, Ohio his permanent residence until he died. Most of his siblings lived within Stark County. His parents, William and Nancy (Allison) McKinley were of Scots-Irish ancestry. He graduated from Poland Academy and briefly attended Allegheny College where he was a member of the Sigma Alpha Epsilon fraternity. In June 1861, at the start of the American Civil War, he enlisted in the Union Army, as a private in the Twenty-third Regiment, Ohio Volunteer Infantry. The regiment was sent to western Virginia where it spent a year fighting small Confederate units. His superior officer, another future U.S. President, Rutherford B. Hayes, promoted McKinley to commissary sergeant for his bravery in battle. For driving a mule team delivering rations including meat and coffee under enemy fire at Antietam, he was promoted to second lieutenant by Hayes. This pattern repeated several times during the war, and McKinley eventually mustered out as Captain and brevet Major of the same regiment in September 1865. Following the war, McKinley attended Albany Law School in Albany, New York and was admitted to the bar in 1867. He practiced law in Canton, Ohio, and became the prosecuting attorney of Stark County, Ohio, from 1869 to 1871. McKinley was elected as a Republican to the United States House of Representatives and first served from 1877 to 1883. He was chairman of the Committee on Revision of the Laws from 1881 to 1883. He presented his credentials as a member-elect to the Forty-eighth Congress and served from March 4, 1883, until May 27, 1884, when he was succeeded by Jonathan H. Wallace, who successfully contested his election. McKinley was again elected to the House of Representatives and served from March 4, 1885 to March 4, 1891. He was chairman of the Committee on Ways and Means from 1889 to 1891. In 1890, he authored the McKinley Tariff, which hurt his party in the off-year elections of 1890, in which he lost his seat. 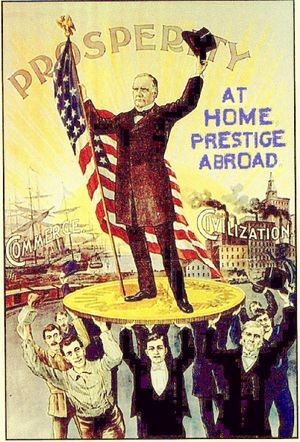 William McKinley defeated William Jennings Bryan in the U.S. Presidential election of 1896, in what is considered the forerunner of modern political campaigning. Republican strategist Mark Hanna raised an unprecedented sum for the campaign and made extensive use of the media in managing the McKinley victory. McKinley promised that he would promote industry and banking and guarantee prosperity for every group in a pluralistic nation. The Democratic cartoon ridiculed the promise saying it will rock the boat. McKinley led the country into the Spanish-American War, bringing the former colonies of Spain in the Pacific (Guam and the Philippines) and the Caribbean Sea (Cuba and Puerto Rico) under American control. In addition, the territories of Hawaii and Wake Island were annexed. Despite some vocal domestic opposition, his administration ushered the U.S. into the " New Imperialism" of the era. He was re-elected in 1900, again defeating the Democratic candidate, Bryan, and by an even larger margin. 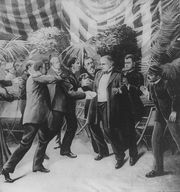 Leon Czolgosz shoots President McKinley with a concealed revolver. McKinley was shot twice by anarchist Leon Czolgosz at 4:07 p.m. on September 6, 1901, at the Pan-American Exposition in Buffalo, New York. One bullet was easily found and extracted, but the second bullet had lodged in a difficult-to-find place. Doctors used the very best 19th century technology to probe for the bullet, which only made matters worse. The newly-developed X-ray machine was displayed at the fair, but it was thought of as a technological novelty, not a serious piece of medical equipment; consequently, no one thought to use it on McKinley to search for the bullet, a procedure that might have saved his life. Also, ironically, the operating room at the exposition's emergency hospital did not have any electric lighting, even though the exteriors of many of the buildings at the extravagant exposition were covered with thousands of light bulbs. Doctors used a pan to reflect sunlight onto the operating table as they treated McKinley's wounds. McKinley's doctors believed he would recover, and the President convalesced for more than a week at the home of the exposition's director. But McKinley eventually went into shock. He died from his wounds at 2:15 a.m. on September 14, 1901, in Buffalo. He was buried in Canton, Ohio. Czolgosz was later found guilty of murder and electrocuted. 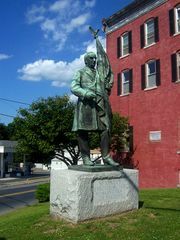 Statue of President McKinley in Walden, New York. Statue of President McKinley at the Lucas County Courthouse in Toledo, Ohio. 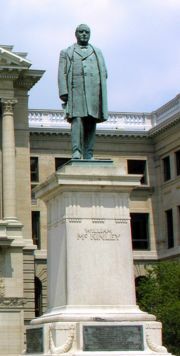 The statue of McKinley in Muskegon, Michigan, is believed to be the first raised in his honour in the country, put in place on May 23, 1902. It was sculpted by Charles Henry Niehaus. McKinley County, New Mexico is named in his honour. Mount McKinley, Alaska is named after him. McKinley Monument, Columbus, Ohio on the grounds of the Statehouse McKinley worked in as Ohio's Governor. McKinley Statue, Philadelphia, Pennsylvania outside Philadelphia City Hall. Calle McKinley (McKinley Street), Mayaguez, Puerto Rico. William McKinley Junior High School, Fort Hamilton, Bay Ridge, New York. McKinley was supposedly the inspiration for the Wizard of Oz in The Wizard of Oz. McKinley's portrait appeared on the U.S. $500 bill from 1928 to 1946. McKinley had a pet parrot named " Washington Post". At his inauguration, the only item of jewelry McKinley wore was his Sigma Alpha Epsilon fraternity badge. After McKinley's assassination, the mandate of the Secret Service was altered to include protection of the president. McKinley was the last US Civil War veteran to be President. "The truth is I didn't want the Philippines, and when they came to us as a gift from the gods, I did not know what to do with them.... I sought counsel from all sides - Democrats as well as Republicans - but got little help. I thought first we would take only Manila; then Luzon; then other islands, perhaps, also. I walked the floor of the White House night after night until midnight; and I am not ashamed to tell you, gentlemen, that I went down on my knees and prayed Almighty God for light and guidance more than one night." "And one night late it came to me this way - I don't know how it was, but it came: (1) That we could not give them back to Spain - that would be cowardly and dishonorable; (2) that we could not turn them over to France or Germany - our commercial rivals in the Orient - that would be bad business and discreditable; (3) that we could not leave them to themselves - they were unfit for self-government - and they would soon have anarchy and misrule over there worse than Spain's was; and (4) that there was nothing left for us to do but to take them all, and to educate the Filipinos, and uplift and civilize and Christianize them, and by God's grace do the very best we could by them, as our fellow men for whom Christ also died. And then I went to bed and went to sleep and slept soundly." The question is whether McKinley said any such thing as is italicized in point #4, especially regarding "Christianize" the natives, or whether Rusling added it. McKinley was a religious person but never said God told him to do anything. McKinley never used the term Christianize (and indeed it was rare in 1898). McKinley operated a highly effective publicity bureau in the White House and he gave hundreds of interviews to reporters, and hundreds of public speeches to promote his Philippines policy. Yet no authentic speech or newspaper report contains anything like the purported words or sentiment. The man who remembered it—a Civil War veteran—had written a book on the war that was full of exaggeration. The supposed highly specific quote from memory years after the event is unlikely enough—especially when the quote uses words like "Christianize" that were never used by McKinley. The conclusion of historians such as Lewis Gould is that it is remotely possible but highly unlikely McKinley said the last part. For a discussion of this question, see Gould 1980, pp. 140-142.